Rubies the popular July birthstone adorn this created ruby pendant with CZ crafted in 14kt white gold.This oval ruby pendant with sparkling cubic zirconia is a epitome of charm. 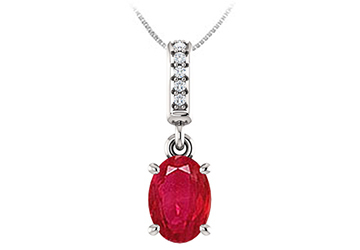 This classic pendant with brilliant cut prong set fiery ruby crafted in 14kt white gold and adorned with CZ rounds is a beautiful way to treasure the price less moments. Free 16 inch 14kt white gold chain is offered with these gemstone pendants.